So you’ve decided to tie the knot overseas. Congratulations! Now comes the fun part. Where are you going? You may have your heart set on a favourite destination, or need inspiration and advice for somewhere new. There are certain destinations where it’s much easier to get married than others. This is usually due to residency requirements. As a result, a well-established local industry has grown up around overseas couples coming to say ‘I do’. Mauritius is among the most popular places to get married abroad. The residency requirement is just one day, there are some great hotels and it’s an easy overnight flight from the UK with no jet lag. This selection of honeymoons in Mauritius ranges from three-star to five-star (also see the latest special offers). If you want somewhere special, I particularly recommend Trou aux Biches. You can also combine a safari in South Africa with beach time in Mauritius. The Indian Ocean islands of the Seychelles have a reputation for being exclusive and expensive (William and Kate enjoyed a secretive honeymoon there), and that is not untrue, but there are also more affordable options – from boutique hotels to luxury resorts and private islands. The residency requirement is just three days. The Seychelles can also be combined with South Africa on this Cape Town, Kruger and Seychelles honeymoon. Sri Lanka is growing rapidly as a destination for getting married. It’s easy to combine the island with a stay in the Maldives (you can’t get married in the Maldives because it’s a Muslim country). It’s only a 90-minute flight from Sri Lanka to the Maldives. See a selection of Sri Lanka honeymoon ideas. Residency requirement is four days. Check out this great twin-centre honeymoon. The Indonesian island of Bali offers genuine romance and exoticism (and fine weather in our summer). See this wonderful collection of boutique hotels and the latest special offers. There is no minimum residency requirement but you need time to apply in person for a marriage licence. There are no civil marriages in Bali, only religious ones, and both of you must belong to the same religion. Some couples opt for a symbolic wedding in Bali after a register office ceremony at home. 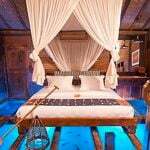 Find out about the best times to visit Bali and honeymoon costs in Bali. Thailand is not just beautiful and cheap, but it’s easy to arrange a wedding, whether you want jungle or beach. 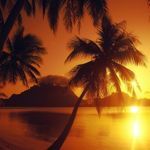 One of the most popular destinations is the island of Koh Samui which is at its best in our spring and summer months. The residency requirement is just three days. See the best times to visit Thailand. There are few more romantic destinations than Italy. Check out the Big Day collection of large houses you can rent for a wedding or reception, such as the XVIII Century Manor on a vineyard in Tuscany which sleeps 33. You’ll find some wonderful hotels on Amalfi Coast, in Venice, the Italian Lakes, the islands of Sicily and Capri and the southern region of Puglia. There is some paperwork involved: you need a Certificate of No Impediment, translated into Italian, and a bilingual Statutory Declaration legalised in the UK. Speak with your tour operator for details. Why not? You can get hitched at The Graceland Chapel in Vegas from just US$440, or push the boat out on a Grand Canyon wedding (helicopter included) from US$4,000. Find out more about how to get married in Las Vegas. With direct overnight flights and no jet lag, South Africa is a great place for a winter wedding (their summer, obviously). My first choice would be Sir Richard Branson’s Mont Rochelle in South Africa’s Winelands, which has 28 rooms and suites. See the wedding options. Other great places to get married abroad include Greece, Cyprus, the Caribbean, Canada, Australia, New Zealand and the Cook Islands. If you want to tie the knot on an exotic beach, I recommend Tropical Sky which has a specialist weddings team and has negotiated exclusive deals including free wedding packages and free accommodation for brides. 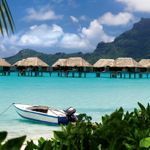 It is particularly good if you’re looking at the Caribbean, the Far East, Africa and the Indian Ocean, but can also arrange weddings in the USA, Canada and New Zealand. Of course, the other option is to have a low-key, (perhaps) registry office wedding in the UK before you leave then have a wedding blessing overseas but treat it like the real deal. The Japanese have been doing this for years. If you’re travelling from the UK, you’ll need to factor in flights. So although Thailand is one of the cheapest countries to get married abroad, getting there will be a large part of the overall cost. A better option might be Greece or Cyprus. Of course, it depends on how many people are going out with you. If it’s just the two of you, you might want to splash out on the flights. If there are a dozen or more family and friends going with you, and you want to keep down costs, the short haul option might be better. If there’s a budget flight and perhaps a choice of regional departures to your chosen destination so much the better. You’ll have to check out accommodation options for your guests. It’s best to offer them a range of accommodation to suit all budgets. If budgets are tight, some all-inclusive resorts in the Caribbean throw in a complimentary wedding package when you take a certain number of guests or stay a certain number of nights. Check out the adults-only all-inclusive Sandals Barbados where you can get married for free. Of course, the whole point of a wedding overseas may be to escape family and friends. In this case, heading off to Australia could be the kindest way of telling them you want to be alone. Many couples head off to wed abroad then have a party back home with all their friends and family. You might like to theme it around your wedding destination. However, if you do take lots of guests with you, it’s a good idea have an escape plan after the wedding so you don’t find yourself honeymooning with the in-laws. Book a second week in another resort or destination. How about Sri Lanka and the Maldives or New York and Bermuda? A safari or Cape Town wedding can be followed by a honeymoon in Mauritius or the Seychelles. See my selection of the best two-centre honeymoons. Decide whether you want to marry at a hotel or an outside venue. Hotels are obviously keen to keep you on property and tend to offer the best deals, but go to a tourist board and they will know lots of outside venues such as historic sites and gardens. 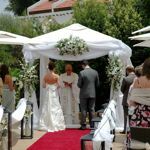 Find my recommended wedding venues abroad and read my advice on beach weddings. There are some great rental properties where you can get married. Big Domain has a wonderful Big Day collection of luxury venues throughout the UK and Europe. If you do book with a hotel, look carefully at what the wedding packages include and how flexible they are on tailoring to your wishes. Many hotels in popular wedding destinations including Mauritius and the Caribbean have dedicated wedding co-ordinators in house who you can liaise with direct before the wedding and who should meet you more or less on arrival to iron out the final planning such as a tour of the hotel grounds for you to choose your exact location for the ceremony, the colour of your flowers, any spa treatments that you’d like, your hair and makeup, manicures and so on. After you’ve booked, there are legal documents that need to be supplied. A good tour operator will usually take care of all this for you and require you to supply all this three months before you travel so they can process your wedding licence. • A 10-year passport (valid for at least 6 months). • If adopted, an adoption certificate. • If widowed, a death certificate and previous marriage certificate. • An affidavit signed by a solicitor stating no legal objection to the marriage. • If your name has been changed by deed poll, proof stamped and signed by a solicitor. Some countries have other requests. For example in Mauritius, if the bride-to-be has been divorced for less than 10 months at the time of the wedding she will be required to have a pregnancy test costing about US$50. In Antigua, the bride and groom must obtain an affidavit on the island at a cost of approximately US$50 to confirm their single status. If you are arranging everything yourself you will need to get accurate advice from the consulate or embassy of the country concerned. A month before, check your vaccines are all up to date with your GP, and keep all your original documentation safe and ready to take with you. Ensure you have suitcases large enough for your wedding outfits and check the baggage allowance with your airline. 1. Choose your wedding outfits carefully. Obviously if it’s a hot location, you’ll need light, natural fabrics, though you might not want to go the Pamela Anderson route and get married in a white bikini! 2. Think carefully about your big day especially if it’s just the two of you. Overseas ceremonies tend to be quick, so you don’t want to feel like it was all over in a flash. Book something special to do afterwards such as a champagne sunset cruise before a special dinner on the sand. Many hotels also follow-up the next morning with a champagne breakfast in bed. 3. On your return home, you don’t need to register your marriage with the register office. You can use your foreign marriage certificate to change your name on your documents and with your bank. It’s a good idea to obtain several copies of your marriage certificate in case you lose the original, as it’s very difficult to get further copies at a later date. 4. Many of the tour operators featured on 101 Honeymoons offer weddings abroad and can give you invaluable advice from their special wedding teams. 5. And one final piece of advice. Don’t tan yourself to a crisp before the wedding. Your wedding photos are meant to be for life!